Story: Bob James (Ha Jung-woo) and his sister were adopted to America when they were little. Bob later searches for his biological mother on a TV show. Bang (Sung Dong-il) is a ski jumping coach and knows that while in America Bob was pretty successful in that sport. The coach was assigned to put together a ski jumping team so that Korea's prospects of a successful application for the next Olympic Games look better. Bob lets himself be persuaded to participate after Bang made him think about the fact that his mother maybe won't get in touch with him because unlike other Koreans who were adopted to a foreign country and came back he didn't achieve anything special in his life. The coach searches for other ski jumpers and finds them in the nightclub waiter Heung-cheol (Kim Dong-wook), Jae-bok (Choi Jae-hwan), who suffers under his strict father, and Chil-goo (Kim Ji-suk) as well as his autistic brother Bong-goo (Lee Jae-eung), who live with their poor and senile grandmother. The group is completely out of shape and the training conditions within a country that has very little experience in ski jumping are rather bad. In addition, Bob and Heung-cheol constantly clash with one another. While Bob finally finds his mother, but doesn't reveal himself as her son, the team has to get ready for their performance at the Olympic Games. Review: Korean cinema has already some experience in the genre of sports movies. Ski jumping is not a form of sport that you would necessarily associate with the peninsula, though. And that is exactly the reason why Kim Yong-hwa took on the challenge to use a real live event - the participation of a little Korean team in the 1998 Olympic Games - as the basis for an entertaining movie and to therefore eventually increase the support of this sport in his home country. "Take Off" was the second most successful movie of the year and the reason why is the well-done technical realization and some of the subplots interspersed with drama, which is supposed to get us emotionally invested. This might appeal to most viewers, but some will realize that the director tries to stick too close to what will undoubtedly work with a wide audience. Including some tear-jerking moments. However, Kim Yong-hwa also doesn't shy away from showing the country's problems through his subplots. There is racism (the studio audience's looks when Bob presents his sister's black husband speak volumes), daughters who work for pyramid businesses and scam their fathers, fathers who hit their adult sons because they don't choose the road of life they had intended for them etc. On a more humorous note, there are some loan sharks and the movie uses the fact that Koreans have problems speaking English. 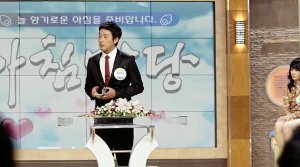 The latter backfires, though, because actor Ha Jung-woo might have a rather acceptable grasp of English pronunciation, but with his syllable clipping and wrong intonation, he just can't pass as an American. At another point, we can hear a German speaker, who apparently also only learned the language a short time ago. Considering all the expenses for sets and CGI-effects, you have to ask yourself, why it is so hard to spend just a little bit more money on a native speaker or on dubbing Ha in post-production. If you take a closer look at the various subplots, you quickly realize that the movie inevitably has to turn out way too cluttered. The problem already arises during the introduction, which drags on incredibly. Later on, each and every one of the characters also gets his/her background story, but the natural flow of the main story gets interrupted by that far too much. But all the subplots are necessary to have enough people sitting in front of the TV during the finale, cheering for the heroes at the Olympic Games. This might even work, but with a running time of 137 minutes (or even 147 in the director's cut version) the movie is just too long, which becomes especially noticeable during the introduction and partly also in the middle. Towards the end, the director uses some technical tricks to make the action a little bit more exciting. At the beginning, there are enough moments the movie could definitely have lived without, though. Bob's search for his mother is the drama's pivotal point. And the development is rather predictable. At the end, you might be confused about the mother's reaction, but at least it is somewhat refreshing. Apart from that, there is also a love story, which does not really manage to gain the kind of ground within the movie that would have been necessary to make us interested in it, though. However, director Kim Yong-hwa knows how to capture some nice images, which is why later on he was allowed to bring "Along With the Gods: Two Worlds" (also with Ha Jung-woo) to the big screen. 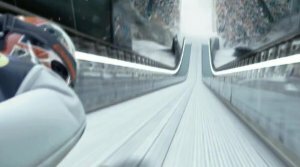 His budget might not have been that big here yet, but the ski jumping is captured in front of a huge audience and at a ginormous ski jump, while discreetly used CGI-effects make the jumping a little bit more action-packed. Therefore, the finale is astonishingly thrilling, even for those who are not interested in the sport. Nevertheless, there are some unfortunate moments when it comes to humor. At the beginning, Sung Dong-il ("The Chase") has to take over too much of the humorous elements, which does not always work that well. Sometimes the humor hits the mark, other times it comes to nothing, which also happens far too often with the autistic ski jumper, who therefore simply seems moronic. When it comes to the humor as well as the drama, the movie should have shifted down a gear. The dramatic scenes never let you doubt the fact that you are seeing a Korean sports movie. All in all, "Take Off" is exactly the movie it wants to be: an entertaining movie that also wants to satisfy a not that demanding audience as a drama. Of course, there is also a sports movie hidden in there somewhere, but if you are searching for a smoother result, you should rather watch "Forever the Moment" or "Marathon". However, fans of dramas with a more easy-going tone will get their money's worth.